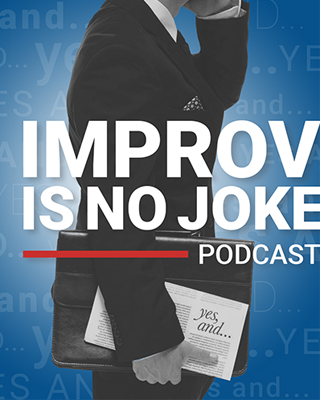 Today on Improv Is No Joke I am talking to Janis R. Cohen, a licensed clinical social worker and author of The Intuitive Therapist. She has been a practicing therapist for the past 25 years, but eight years ago her practice changed dramatically when Janis’ intuitive and psychic skills opened up and her practice completely shifted. Janis is a clairvoyant, an empath and a medium. Janis’ goal in life is to teach other people. She wrote The Intuitive Therapist because she wants therapists to know how to do what she does so that they can help their clients faster and more effectively. It offers both professionals and laypeople effective strategies for getting in touch with the major driving system within them – their intuition. She also wants to provide real, tried-and-true strategies about how to problem-solve on your own. She will do whatever it takes to help her clients achieve happiness, and all of that together was the impetus for her writing the book. Intention – Start with the genuine intention of noticing and connecting with your intuition. Be aware – Be aware of everything around you and within you. Imagine – Be in a space of fun and fantasy, in which you are open to receiving the messages. Write It Down – Validate that your intuition has the strength and ability to guide you and lead you in all the right directions by writing down your experience. Acting – It’s taking what you become aware of, noticing what’s going on and just going and doing. Trust – Trust what you get. What many five-sensory people do with intuition is they immediately discard the immediate sense that they get. Environment – Live in a space that validates that your intuition plays a key role in your decision-making, your relationships, your job and how you show up in this world. There’s an interesting cross section between intuition, improvisation and service professionals. It’s all about serving your client or audience. The strategies that Janis employs are similar to the strategies that all service professionals should employ – there’s a know, like and trust factor that dictates if your client will buy in. They have to know you are adaptable to their needs and like you as a person before they can offer you their trust. 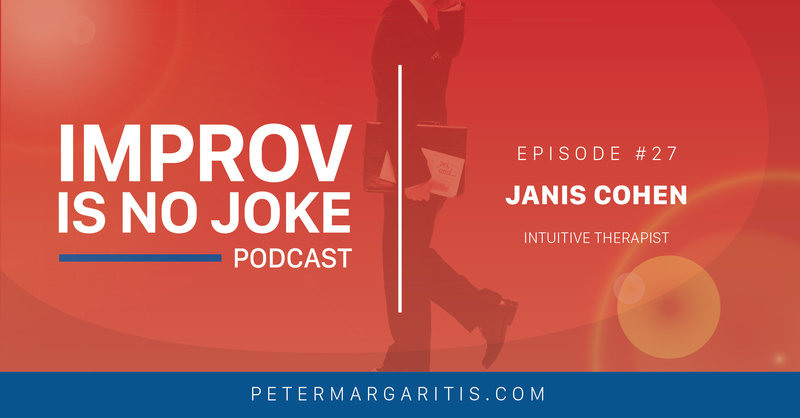 I’ve known Janis for years, but I really enjoyed learning more about her life, her process and her business – and I absolutely loved reading The Intuitive Therapist. It made me think in different ways, which I always love to do, and I appreciate Janis for taking the time to write something that helps people. Peter: Hey everybody, Pete Margaritis here and I’m really excited to have Janis Cohen on my podcast today. I’ve known Janis for a number years and she has just published the book The Intuitive Therapist. Janis is a licensed clinical social worker and I’m so looking forward to this conversation because I did read a book and I found it fascinating. I’m looking to hear more about it from her perspective but, first and foremost, Janis, thank you so very much for taking time out of your busy day to spend some time talking with me. Janis: Oh, I’m so happy to be here. This is great. Peter: I am also so proud of you for writing this book. I know we talked a couple years ago, when I was doing mine and you had just started writing your book, and it sounded like, to me, that it just all of a sudden ground swelled and you were able to complete it, I think, a little bit earlier than you had planned. Janis: Yeah, actually. In the last six months before I submitted to my editor – which is like this major, intense writing commitment – everything seemed to come together. Peter: That’s great. It’s out on amazon.com and I highly suggest that everybody go out to purchase the book. It is an interesting read. So my audience can get the chance to know you just a little bit better, can you just give us a little about your background? Janis: Absolutely. Well, I’m a native Atlantan and I love the South – lived here all my life. I went to the University of Georgia for undergraduate and graduate school, and I’ve been a therapist for the past 25 years. I’ve worked in a number of settings, from private schools to community mental health to group homes, and I’ve been in private practice for the past 17 years working with kids, adults, families and couples as a traditional therapist. Then, about eight years ago, an amazing thing happened: my intuitive and psychic skills opened up and then my practice completely shifted. So the intuitive psychic skills were all intuitive and I will get into that in a little bit, but the psychic part it is really what’s transform not only my life but also my practice and how I work with my clients. I am a clairvoyant, an empath and a medium. As a clairvoyant, I see images, words, people, past lives, places connected with my clients. I also see their energy and emotions. I see their personality without them even having to tell me anything. As an empath, I feel what they feel. It will you either show up literally, in my body, or metaphorically, as a representation of what they’re going through. So that, in itself, has transformed how I work with clients, and now I do what’s called Intuitive Therapy. Peter: Wow. I don’t know where to begin, other than asking what prompted you to write this book? Janis: I love sharing my knowledge, and my clients have actually been asking, “When are you going to write your book? When are you going to write your book? I gotta learn. I gotta learn.” My goal, really one of my purposes here on earth, is to teach other people. What I’ve understood is, in all my past lifetimes, my purposes is a healer. So I really wanted people to get a sense of who I am; how I got to this point in my life; what I’ve been through; but also to really give professionals and laypeople really, really effective strategies about how to get in touch with the major driving system within them, which is their intuition – but also to provide real tried and true strategies about how to problem-solve on your own. I am addicted. I am obsessed with helping people end their pain and suffering. I will do whatever it takes to help my clients achieve happiness, and all of that together was really the impetus for me writing this book. I want therapists to know how to do what I do so that they can help the clients faster and more effectively, that was that was the purpose of this book. Peter: Wow. So you mentioned that about ten years ago something happened that allowed you to recognize these psychic skills. What was that event? Janis: It was amazing. It started with one session. I had a client come in and they were talking about one thing then all of a sudden these things came out of my mouth that I could never have planned on. What I said was not of me. I knew it was not of me because it came through me, and I couldn’t possibly have known the specifics of what came out other than something outside of me – and then it went to the next session with a different person and the next session with a different person, and they were making progress within 20, 30, 60 minutes that I normally saw three months to a year. It blew me away, and at first I didn’t know what was happening. I had no idea. I just all of a sudden started to be able to pinpoint, with laser-like accuracy, what the heck the root of the problem was and then offer very specific, unique strategies to my clients. Then, as I began my spiritual journey about 17 years ago, I kinda went through this zig zag of meeting different people, reading different books, studying on my own and I was able to connect fairly recently – within the last seven, eight years – with like-minded, spiritual people and I learned that I have these gifts. Then, through my exploration and being around these other gifted people, here I was – I’m a clairvoyant, I’m an empath, I’m a medium. That’s kind of how it evolved, and then it just became an automatic way of working with my clients that I couldn’t deny any longer. Peter: That’s incredible. Can you share some things that you have helped? Your clients have come in with with these problems, and how were you able to help them with your skills? Can you describe something along those lines for us? Janis: Yeah. A client will come in and, if I’m doing a psychic reading or even a session, and they say, “I’m struggling with this, what do I need to know, what next steps do I take?” What happens is, prior to them coming in, I get into a channeling state. So I meditate and I’ll set myself up and I as Janis will move out of the way, and then we’ll kind of be open to channel information. The minute that we start identifying what it is that they want to know about I’m literally shown things, whether it’s words or images or places or things. So I start sharing that and I start getting additional information that helps them understand, almost immediately, what it is their struggling with. I literally see things – that’s the bottom line. I see things that clearly identify the challenge that they’re going through, which to me is crazy amazing. I am still blown away by it, but I love it. It’s so exciting for me every time somebody walks into my office. Peter: I can imagine so, and I have known you for a very long time. I read your book cover to cover and I learned a lot more about you than I ever knew before, and right now with this conversation I’m learning more. I guess the one question I have in my mind: what do you say to the skeptics, or does that even come into your concentration or thought process? Janis: Because I know that the majority of people I talk – the minute I tell them I’m a clairvoyant, empath and medium along with being a veteran therapist – it’s literally like the air gets sucked out of the space we’re in. Janis: And they finish our conversation because they don’t know what to do with it. So I don’t mind and I laughs, I get excited about that, because it’s just how the world is. Everybody’s on a different path, everybody has a different level of awareness, but what I know is that once you experience my gift you’re forever changed. You can’t deny that it’s true because I’m shown things about you that I could never, ever know simply by tapping into your energy. Peter: So, when you describe this 5-sensory individual, I think you described a lot of my audience, which are Accountants, CPA’s and business leaders, but in your book you talk about the 6th sense. Could you talk about that? Janis: Absolutely. The 6th sense – everybody has heard of the movie The Sixth Sense – that is when you go beyond thinking, and it’s really connecting with what what is called the higher mind and beyond the typical five senses of evaluation, so to speak, or experience: sight, sound, taste, touch and smell. So the 6th sense is all about going within and then receiving information outside of yourself – whether it’s through spirit guides, angels, that kind of thing. But really the 6th sense is all about that intuition – that internal power center that guides you, that gut instinct, that sense of something. So, six-sensory people can live in that flow of trust in the universe – that what I set, what I feel, what I know that isn’t brought on by thought is truth, and so I actually made that shift. I was very much a five-sensory therapist: very clinically oriented, focused on certain ways of doing things, and then through my own spiritual evolution I was able to be guided to living from an intuitive state. Peter: So can a five-sensory individual learn more about how to be more intuitive or is this just a gift that we have? Janis: Look, everybody is intuitive. You can develop it more, but the the very cool thing – and I write this in my book – is that we use our intuition all the time. Every single person does. You may not call it intuition, you may not recognize that it’s intuition, but we use it all the time – and I give a number of examples in the book. I’ll just say one for example. Let’s say you’re about to leave the house and you see your umbrella on on the table. You hesitate but you decide to bring it, and then lo and behold you walk out and it’s raining, or you leave work and it’s raining. Had you not brought your umbrella, you’d be drenched. It’s things like that. Everybody has a capacity to use their intuition. We do it all the time with decision-making. It’s that gut instinct. Peter: Okay, if somebody in my audience is listening to this and thinking, “I’ve got the gut instinct, but how can I strengthen it? How can I get more in touch with being more intuitive and bring it to the forefront of my mind versus buried?” Is is just by doing that and being more aware of things that are happening around you that you strengthen that your intuition? Janis: Yeah, I think without a doubt. I have a seven-step process that I teach people. The first thing is to really have the intention of noticing and connecting with your intuition – that vibe, that gut instinct. The second step is to be aware – to be aware of everything around you and within you. We all have that “uh-oh” feeling. That’s intuition, and to be aware of signs – whether it’s a song on the radio or a number that you see on the clock repeatedly or something that comes up on your facebook feed that reinforces something you were thinking about – that’s the awareness. The third step is to imagine. To be in a space of fun and fantasy and being open to receiving the messages, and I tell a lot of people, for the fourth step, that it’s to really validate that your intuition has that strength and that ability to guide you and lead you in all the right directions is to really write down your experiences. So let’s say you are at the stoplight and you happen to look down and all of a sudden you look up and you see this sign that basically says, “Everything is okay.” Had you not follow that a gut instinct to look up, and used your free will to stay looking down at whatever you were looking at, you would’ve missed that sign and it could have been the very thing that you need to see that day. So the fifth step is acting. It’s taking what you become aware of, noticing what’s going on and just going and doing. It’s following through with behavior. Then, of course, the sixth step is to trust. Trust what you get. So much of what five-sensory people do with intuition is they immediately discard the immediate sense that they get. Then the last step (seventh step) is to really live in a space that validates that your intuition plays such a key role in your decision-making, your relationships, your job, how you show up in this world. Intuition is the basis for everything. Peter: So, with transparency, after I read your book I have been trying to follow these steps. In my case, I’m just trying to be more aware of my surroundings and writing things down. It’s been an interesting exercise over the last week or so, and some of the things that I’m seeing, feeling and writing down I know I would have written down in the past – so I’m in the process of trying to collect this data over time and see if I can see some patterns out there. You now, as I say even within my book, how many days does it take to create a habit? Well, it’s about 21 – but it takes a lifetime to maintain it. So I’m trying to start that habit and I’m trying to be more aware of my surroundings and be more aware of my intuition, because there’s times, when I meet somebody for the first time, that I get this really weird feeling and I follow that. I follow my gut when I when I meet people, or sometimes when I meet people I get this really great feeling. You know, it seems to work out that way. Is this how you help your clients? You make them aware once you get their buy-in, per se, and they become more aware of this, and you say you make huge strides within that first session. How many times after that do you see that person, or what type of strategy do you put in place? Janis: Well, I’ll tell you what. I think the biggest strategy that I put in place is to teach people how to trust themselves because anybody that comes into my office, anybody that goes to a therapist, anybody that seeks somebody out to help them understand something already knows the answer. So I approach all of my clients, whether I’m seeing them for a psychic reading or whether they’re a therapy client, I approach them with the knowledge that they already know what they need to know. They just need to talk it out, hash it out. They need some some sort of validation or affirmation, and so I lead with that. My goal is to get my clients to trust themselves so that no matter what decision they have to make, whether it’s a momentary decision or a life decision, that they are so comfortable with trusting themselves and who they are that that becomes easy. So, beyond that, it’s kind of what do you have going on and I go with the flow, and then I’m also guided about what next steps to take: what questions to ask and how to use my skills as a clinician to help them. Peter: So adaptability is a big piece in this, as you say “go with the flow,” “be flexible,” things along those lines. Janis: Correct. Absolutely. With awareness, there’s no agenda – and I find that, no matter what anybody does, if you have an agenda it’s going to compete with somebody else’s. So if you’re being a service, even with CPAs, then people are coming to you for you to fulfill the service. If you are caught up only in how you do things, only your idea of what should be done, you’re gonna miss a whole heck of a lot and there really isn’t that much of a personal connection. So, to be present and be aware, knowing that you’re here to serve your client. You may be a driver in terms of the direction that the client goes in, but you’re there to serve them based on what their needs are. That’s really, to me, how you get good at anything. You are the most effective if you’re your present. 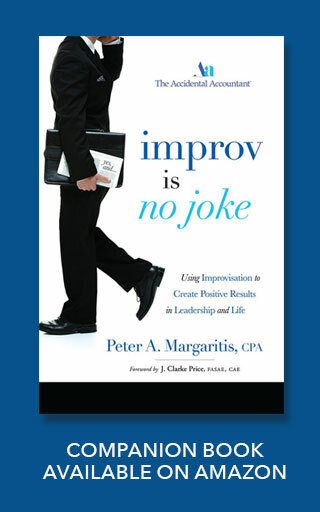 Peter: I love how you use the words present and agenda, and you’re indirectly using the phrase “ability to listen to your client.” I know you’ve read my book, which is all along the same lines, the principles of improvisation, and really, like you said, it’s about serving your client. It’s not about you, it’s about them – and, the more you make it about them, the more trust, the more respect, the stronger the relationship becomes and can grow versus “It’s either my way or the highway.” You don’t grow a business that way. You don’t grow a country that way. You have to have the ability to use your intuition, the ability to use your knowledge and experience and be flexible and adapt to given situations, really, is is the key in life today. Janis: Yeah, and I talked about this in my book. First of all, to be able to get your clients to buy in, there’s the know, like and trust factor. If you really want to maintain your clients in any service industry, they have to feel like they know you and they know what you’re about. So there is a personal element: they could see themselves having coffee with you or telling you some of the deeper things that are going on with them. Not everybody can establish that kind of rapport, but it will sure carry you far and wide with clients who could possibly be ideal referral sources – and then, of course, they gotta like you. Janis: Then they offer that trust. So, if you can share space with them, if you can be present and hear what they need – in any service industry – your business will, without a doubt, grow. Peter: Well said. Well said, my friend. And this is just based on my curiosity: what pointed you in the direction of becoming a licensed clinical social worker? What pointed you in this direction of therapy? Janis: Well, a few things. I grew up in a household of therapists. My father is a veteran clinical psychologist, one of my sister’s is a counseling psychologist. My other two siblings are not and my mother is not, but we grew up very therapeutically, so to speak, where we were taught how to express ourselves and learn about all this – but also, truly, when I was a little kid I remember this story from when I was about five. There were these two kids that were playing in a pool on vacation. They both had water pails. I thought they were fighting, arguing, so I went up to them and I said, “Oh no boys,” and I got both pails in the face. Janis: So, you know, at a very, very early age I’m intervening. I want people to be okay. But then, as I went through different experiences in my life, I realized that they have to have some sort of impact in my life. It can’t just be I experience some negative things and that’s just it, and so my understanding about how to use my life experiences ended up really serving a purpose in terms of the quality of work that I do, I just understood that my is to learn, to grow and to teach – and that’s just been a pattern. So I feel like it’s just been a shoo-in from many, many past lives, and then it just kind of came into fruition in the way that I do it now. Peter: So it’s been a great journey from birth, being being in a household with your father being a therapist and learning and and it’s just guided you all along this path. So how is your business today? And I don’t mean exactly today, but have you been able to grow your business over the last eight years since you’ve really come in touch with your intuitive self? Janis: it’s been amazing. Once I owned that part of myself, and then once I combined them, my whole practice shifted. It ended up being this this niche practice that is growing. People are seeking my kind of therapy out because either they spent years and years in therapy and they kind of exhausted the resources with that therapist or, as many people are doing now these days, they’re becoming more spiritual. They really want to discover that other part of themselves and then they want this complimentary therapeutic aspect too, so fortunately people are seeking me out. Even therapists are looking for supervision to move forward in this kind of direction, so it’s grown beautifully. I’m just so grateful. It’s exciting. I could never have predicted that I would be doing this, in this way, but it just fit. Peter: And you can tell it in your voice. You’ve got so much passion in that voice and I’m so happy that your business is growing. I know we talked years ago, and I don’t think you were quite there with the intuitive side and your were struggling with the practice a little bit. I’m so happy that you have found this and that you’ve been able to help a lot of people. Now, I’m going to ask a layperson’s question here because I don’t know: do you have to be face-to-face with someone in order to do your type of intuitive therapy, or can it be done through other means of technology? Janis: Oh, yeah. I have worked with people all over the world. I do not need to be face-to-face. All I need to do is connect with energy. In fact, I was able to do a reading for somebody in India via private message on Facebook and it goes to that extent. I work with people in Italy. All I have to do is connect with your energy and I can immediately channel. So geography and location – there’s no additional limitation. It’s great because I get to help more people, which is awesome. Peter: Yeah, that is so outstanding Janis. Is there anything you’d like to leave with this audience before we wrap up? Maybe it’s a thought, or something to help them, to think about on a daily basis. Janis: I think the biggest piece is to know that everybody has the gift of intuition within them, and to really look at look at your life and see where you’ve used it before, where you’ve trusted your gut and how it’s worked out. I know that, no matter what happens, it is the result that’s meant for me, or for you, and to really tap in to this gift – I don’t care what you do for a living or how successful you are. There’s some part of your life that isn’t exactly right and if you would be able to lean into your that intuitive side, that wisdom within, it truly will change your life. I want people to feel as strong and empowered and courageous as possible in their lives and to make decisions from a real centered and whole place. Peter: That’s outstanding. And if someone wants to get ahold of you, what’s the best way to contact you? Janis: You can do it directly at Janis@janisrcohen.com, you can call me 404.558.3971, or you can go on my website, janisrcohen.com, and it will be my pleasure to read for anybody or help them. Peter: That’s wonderful. Well, Janis, I can’t tell you how much I appreciate you taking the time. I love learning more about you and I absolutely loved your book. It made me think in different ways, which I always love to do, and thank you for taking the time to to write something and to try to continue to help people. Thank you so very much for that. Janis: Thank you, Pete. It has been a pleasure. Thanks for having me on. Peter: Anytime, my friend. Maybe next time I have you on we’ll see if I take a little chance that maybe you can do a reading for me. Janis: Okay, will do. My pleasure.